To anyone who has many years spent birding or watching nature, the Leica Trinovid name has a certain cache associated with it. 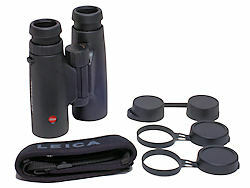 Back in the late 1970s, Leica Trinovids were arguably one of the 2 or 3 finest binoculars available. 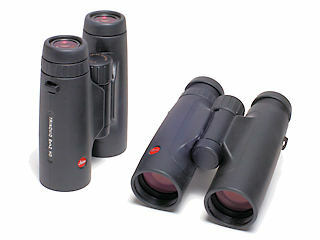 They were a slim, compact, lightweight binocular with crisp, bright image quality that was simply seductive. Then the dark years came. Leica released a version of the Trinovids that featured some garish color choices for the armoring (including bright red!) in a compact but rather heavy binocular. Making matters worse, the armoring of those Trinovids had metal ridges that made them uncomfortable to hold, especially with prolonged use. In a market where birders demand an almost impossible set of traits from their optics such as completely sealed, waterproof, close-focusing, brilliant optics with a huge field of view, there seemed to be no place for those Trinovids. When Leica introduced their Ultravid line in 2007, it seemed like the coffin was nailed shut on the Trinovid line. Well, that would have been too hasty! The sport optics market is still huge, and there is a significant portion of it that can’t afford the $2000 price tag of the Ultravids. Into this mix comes the new Leica Trinovid HD line, and it’s a return to everything that made the old Trinovids so beautiful: slim design, lightweight and comfortable in the hands, and offering sharp and compelling views. We got a 10x42 HD model for review, and we are pleased to report that these new Trinovids are absolutely lovely! Both the new Trinovids are compact at just under 6 inches (15 cm) tall with the eyecups fully extended and slightly less than 5 inches across (< 12.5 cm) with the hinge fully open. 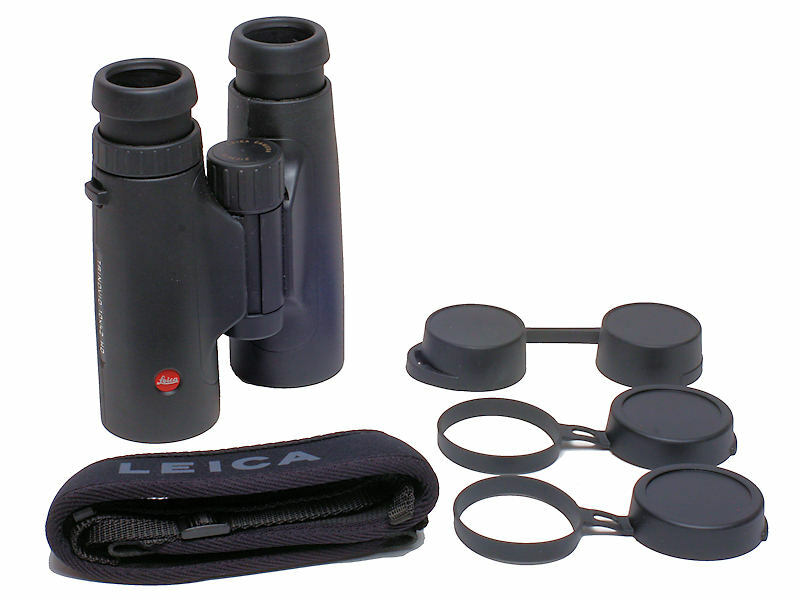 Leica claims the binoculars are just a shade under 26 oz. in weight, though this probably doesn’t include the weight of things like the lens covers. It probably doesn’t matter. The black rubber armoring has a matte finish and a tacky feel that makes them stick to the hands in a very appealing way. Ergonomically, these binoculars seem to demand to be held, which is just perfect! Like all good roof prism designs these days, the Trinovid HDs are fully sealed, nitrogen-purged and totally waterproof. Leica Trinovid HDs offer a broad interpupillary distance range of 58-76 mm which means they should comfortably fit most people’s faces. One pleasant surprise about the new Trinovids is their close focus capability. The 10x42 Trinovid HD close focuses down to 5.3 feet without significant field collapse. The 8x model are a bit longer at 5.9 feet. In this respect, the Trinovids actually outperform the Ultravids, whose minimum close focus is a bit under 10 feet. The 10x42 Trinovid HD offers a 339-foot field of view at 1000 yards, which is a bit better than average; the 8x42 Trinovid HD has a 372-foot field of view, which is just about average performance in this regard. The 10x Trinovid HD provides 15 mm of eye relief, while the 8x model offers 17 mm. These are both average values for this characteristic, and should be comfortable for most users. Leica Trinovid HDs meet the highest industry standards in two significant traits: the prisms are made of phase-coated BaK-4 glass, and the lenses are fully multi-coated. Those characters are essential in high-performance binoculars, so the Trinovid HDs get a high rating for these. So what does this all add up to? The view through these new Trinovid HDs is beautiful: bright and sharp, detail-rich and featuring that classic Leica high-contrast image that seems to augment the brightness. Leica took a very innovative approach to two other things that impact ease of use, one of which we really liked. The eyecups adjust with the usual helical twist mechanism, counter-clockwise to extend and clockwise to retract. What’s unusual about this is that they have 5 stable positions between fully up and fully down. All are marked by firm detents, and the eyecups don’t collapse unintentionally during normal use. Basically, these are excellent eyecups! The diopter adjustment is a simple twist ring on the right barrel. It’s non-locking, but quite firm, so it tends to stay where you put it. It’s a simple, functional mechanism, but nothing fancy. The other subject we’ve not covered is the peripherals: the lens caps, strap and case. This one is a mixed bag – we liked some of what Leica did, and didn’t like other things. The ocular lens cap is a pair of deep, pliable rubber caps linked by a very flexible bridge. It fits firmly over the eyecups and won’t come off even when the binocular is inverted and shaken. The cover has a single bracket on the left side through which the strap may be fitted or not – your choice. That’s pretty much perfect for an ocular lens cover. There are also objective lens caps, but they don’t come on the binocular, for reasons we’ll get to shortly. They’re actually quite nice. They are deep cups of pliable rubber that fit firmly over the exterior of the barrel ends. Once closed, these will only open when you pull them open. They are attached by short tethers to rings that fit around the ends of the barrels. The rubber is soft enough that they won’t close by themselves, and the cups are heavy enough that they are unlikely to blow up in front of the lenses. These are as nicely executed as objective lens caps can be. There is also a traditional neck strap, a molded neoprene and leather hybrid that is quite comfortable if you prefer a simple strap. There is no case. Instead, it is replaced by a harness strap that is so different it’s difficult to describe. Generally, we like harness straps, but not this one. This harness is a broad, neoprene sling with intrinsic cordura straps that attach to the lugs on the binocular. So far, so good. The sling has two long sections (we’ll call them “sleeves”) joined in a loop that goes around your neck. It’s about two inches wide and several millimeters thick, and it’s not too spongy so the binocular doesn’t bounce much. A cordura belt that circles the waist attaches with two double-toothed clasps, holding it more firmly in place – still good. The two sleeves are permanently fastened together at the bottom, and they can be zipped together almost all the way to the top, so you can adjust the fit as you wish. Additionally, there is a double-toothed clasp on the two sleeves that snaps across the binocular to hold it close when it’s not in use. Again, all fine. The sleeves are slotted open vertically along the inner side so the binocular fits into shallow pockets in the sleeves. Okay, that’s different, and not so good. It’s difficult to get the binocular into and out of those pockets, which means if you have it inside, it’s slow to deploy, and when you need to stow it away, it’s both slow and awkward. This harness is expected to fill the role of a case, which would be fine, except that the pockets don’t completely cover the objective lenses, leaving an opening for dust and grime to get on the lenses, even when the binocular is put away. You can put the objective lens caps on, and still fit the binocular into the pockets. This solves the dust and grime problem, but it makes the binocular even harder to get into the pockets, and it means deployment is even slower. You really can’t win here. We don’t like being negative, especially not about an optic we like (and the Trinovid HDs are a really nice optic) so we let other people play with it and asked their opinions of it. They were pretty much unanimous in liking the binoculars but not liking the harness. Okay, it’s not just us! Fortunately, you don’t buy a binocular for the strap, and equally, you don’t reject it because of one. Just buy a low-cost replacement harness and use it instead of this one. It’s worth noting also that the Trinovids do come with a traditional neck strap that is perfectly fine, but if you opt for it, you still need a case. Fortunately, there are third-party replacement cases available too. There may even be replacement cases available from Leica. There’s a lot to love about the new Trinovid HD binoculars, including one really important one: the price. The 8x42 Trinovid HD sells for $949.00, and the 10x42 model is $999.00, so both are under $1000. The ergonomics of these binoculars are great, and the quality of the image is everything we’ve come to expect/respect from Leica. In the end, the issues with the harness don’t significantly detract from what is optically a beautiful binocular. And at this price point, there’s no denying that the Trinovids are a very serious heavyweight contender! In summary, the legendary Trinovid brand has finally found a new niche, and we think they’re going to fit in very well.